Scripture tells us that the risen Christ is truly the same Jesus Who died. Thomas was one of the twelve apostles but was not with them when Jesus appeared to them earlier. So the other disciples told him, "We have seen the Lord." But he said, "Unless I see the mark of the nails in his hands and put my finger into the nailmarks and put my hand into his side, I will not believe." 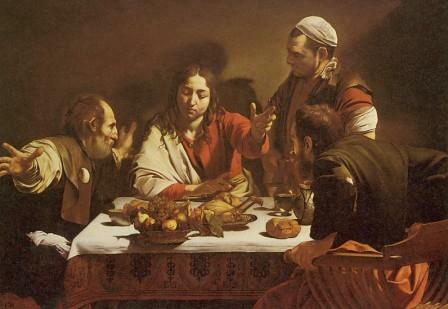 A week later Thomas was with the disciples. Jesus appeared among them and said, "Peace be with you." 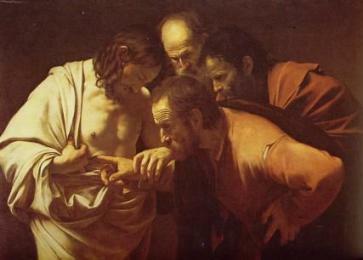 Then he said to Thomas, "Put your finger here and see my hands, and bring your hand and put it into my side, and do not be unbelieving, but believe." Thomas answered and said to him, "My Lord and my God!" Jesus said to him, "Have you come to believe because you have seen me? Blessed are those who have not seen and have believed." On the road to Emmaus some of the disciples spoke with Jesus, before recognizing Him as the same Jesus they previously knew. And it happened that, while he was with them at table, he took bread, said the blessing, broke it, and gave it to them. With that their eyes were opened and they recognized him.